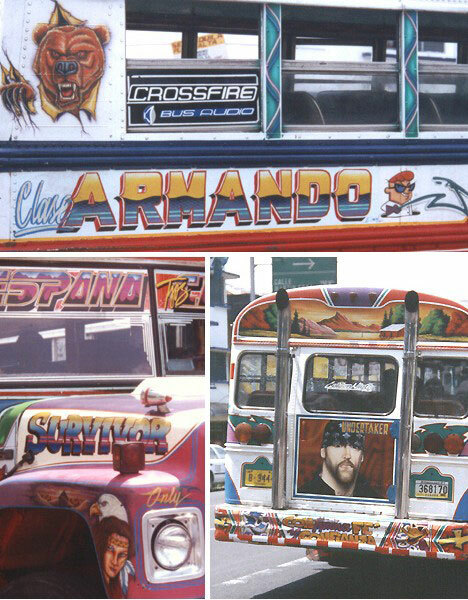 The words Bus and Boring share more than just their initial letter but that hasn’t stopped an assortment of visionary artists from jazzing up this most utilitarian form of transport. These 15 examples epitomize the height of slick transit glorious! Bubble gum on a bus? Sure thing – and not just stuck under the seats. One of the most enduring 4-wheeled symbols of TV pop culture hit the road in 1970 when The Partridge Family painted an old school bus in psychedelic Mondrianesque graphics and hit the road to faux-musical stardom. 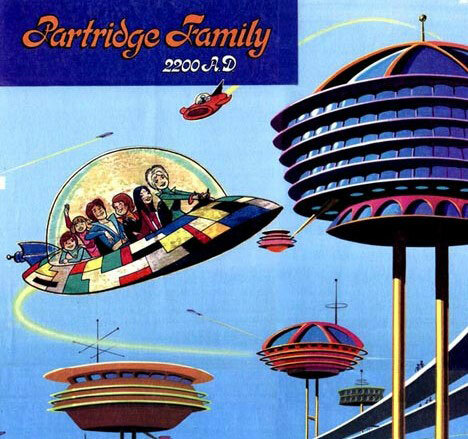 The series was revived in Partridge Family 2200AD, an animated cartoon version that, while supposedly taking place 200 years in the future, still managed a classic 1970s aesthetic right down to Laurie Partridge’s bell-bottoms. 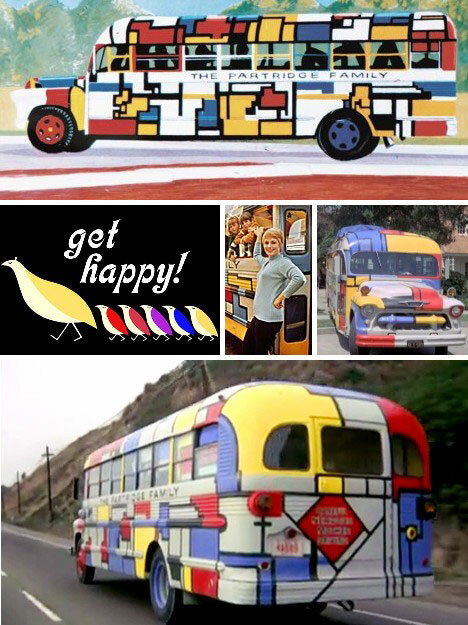 The Partridge Family bus also got a radical makeover, as seen above. 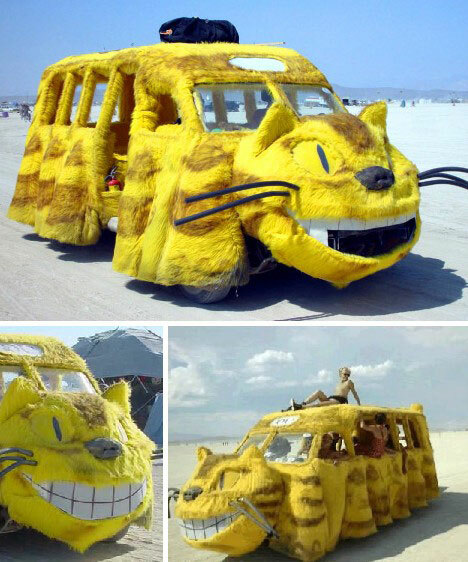 First seen in the Miyazaki animated film My Neighbor Tortoro, the CatBus moved on to bigger and better things… like Burning Man 2002. Stranger things have been spied upon the Playa but few have been more striking. 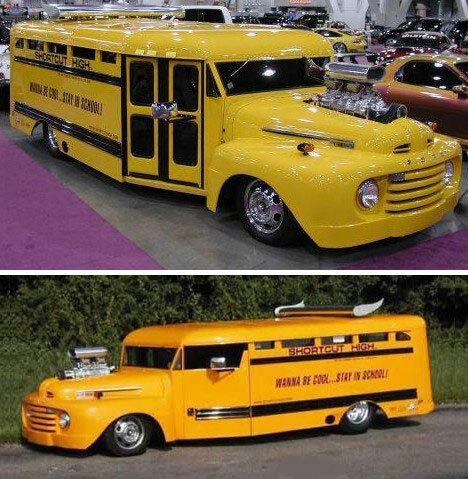 It’s too bad every school bus didn’t look like the Cat Bus… generations of students would have arrived at school in a much better frame of mind. 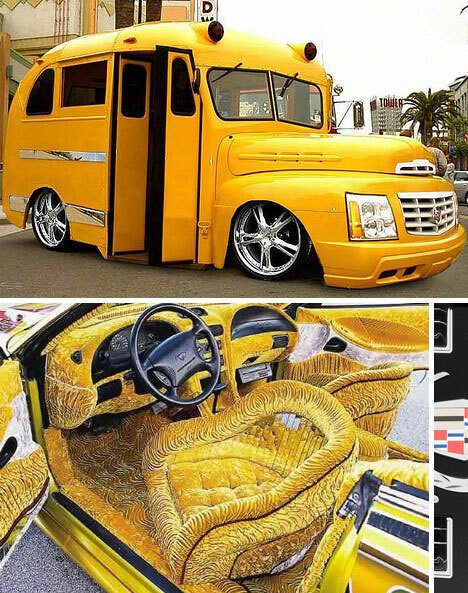 Students at England’s Ellesmere Port Specialist School of Performing Arts don’t mind riding the short bus, and neither would you – if it was a low-riding, pimped out Caddy SUV bus! Info on the pimped-out bus is few and far between but it seems to be an actual bus that has received a Cadillac Escalade front-end conversion with air suspension. Didn’t make it into that swanky British performing arts school? Pity – instead of a cool Caddy you might be stuck riding the Tricycle Bus instead. 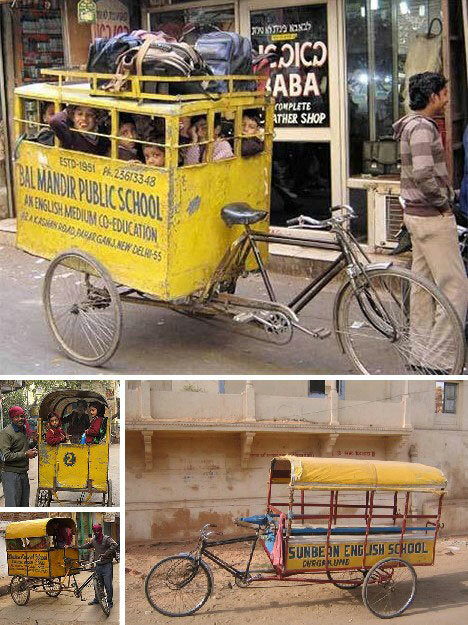 This shortest of short buses brings kids to an Indian public school much the same way farmers bring their livestock to market. At least the kids aren’t destined for the stew pot… one hopes. Study hard, kiddies, study VERY hard! 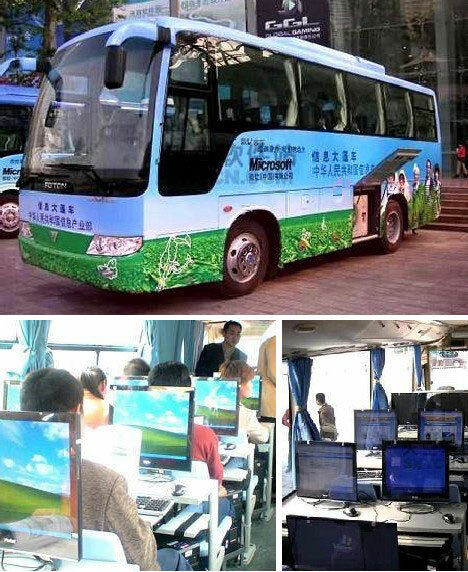 At the opposite end of the scale is this rolling computerized school bus sponsored by Microsoft and enjoyed by students in China. You’d better believe the kids riding on this bus will be exceptionally well behaved and won’t even think of tossing an action figure attached to a very long string out the window. Geez! 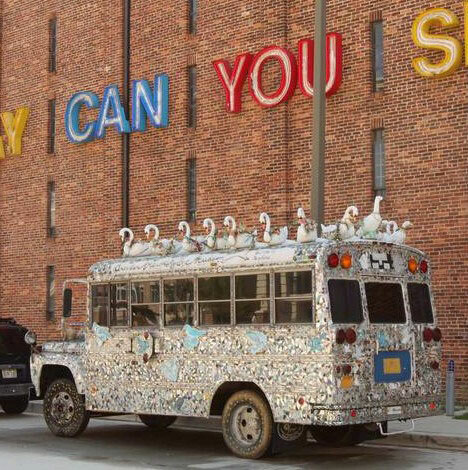 The American Visionary Art Museum in Baltimore is weird enough on its own but the bus parked right outside adds just the right amount of wacky. The bus is covered in pieces of broken mirror, then decorated with assorted bird and animal figurines because, well, why not? 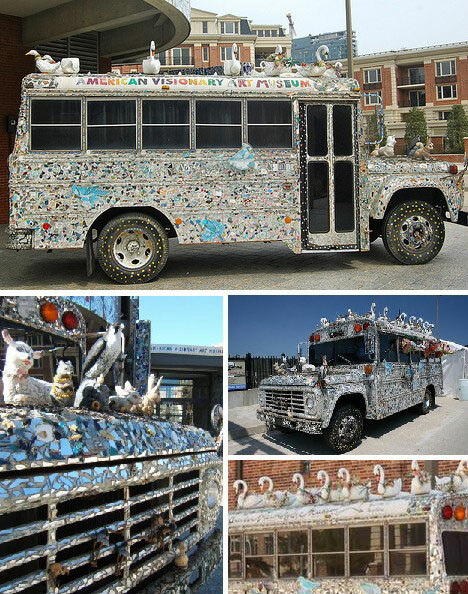 Forget that Caddy SUV bus, if I’m going to art school THIS is the ride of choice! 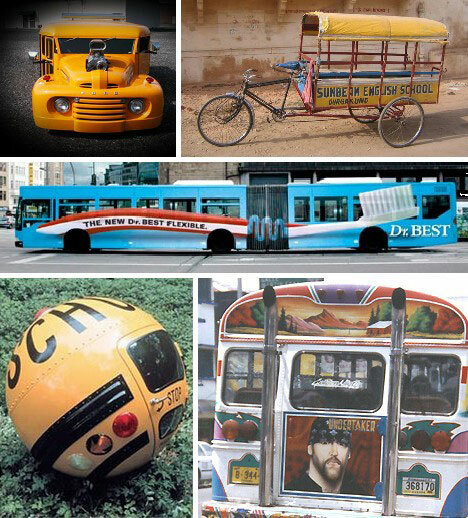 Panama has a long tradition of painting city buses as elaborately as the owner desires. Sadly, this blast of local color may be coming to an end – authorities prefer that all buses be painted in standard color schemes to match their route. On the bright side, do you really want to ride a bus that features The Undertaker on its rear emergency door? Advertisers just love buses; probably has something to do with huge, double-sided flat spaces that move through crowded urban areas on a regular basis. Since jaded city-types tend to tune out ordinary ads after a while, something striking is needed to drive home the message. 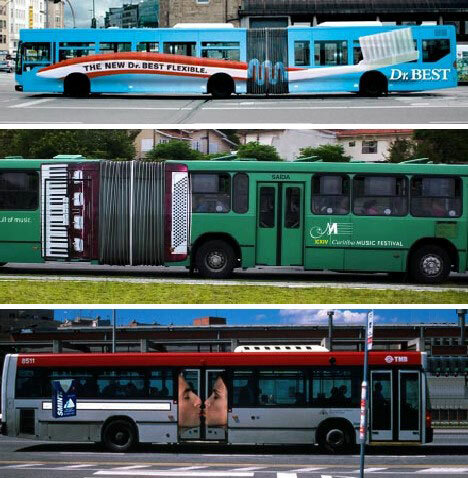 In the images above, marketers take advantage of articulating buses and sliding entry/exit doors by incorporating their functions into eye-opening guerrilla advertising. 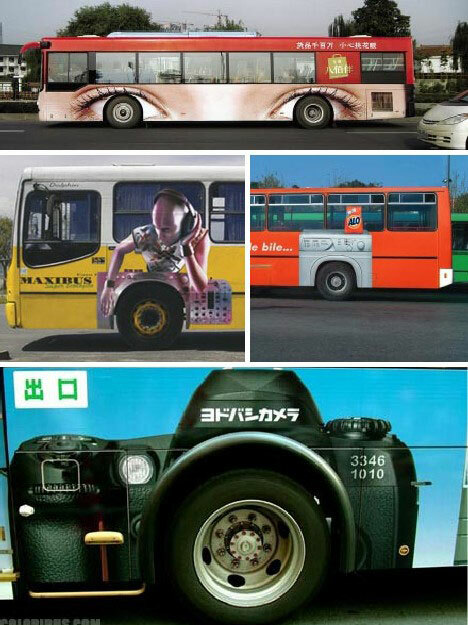 Even big bus wheels are fair game – integrating a wheel or wheels into an ad also expands the area which can be used as ad space. Above are several choice examples that wheelie grab one’s attention. 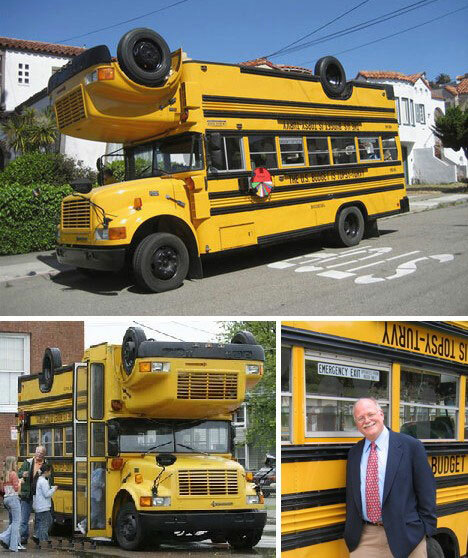 The Topsy-Turvy Bus was built by artist Tom Kennedy and commissioned by Ben & Jerry’s ice cream co-founder Ben Cohen working through BLSP, an acronym for “Business Leaders for Sensible Priorities.” The message being spread is that the U.S. budget is out of whack in a big way, to the extent that the government’s priorities are upside down. 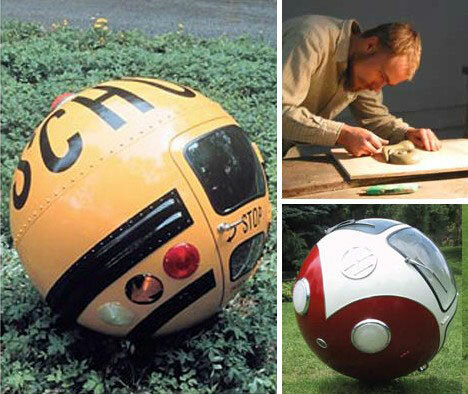 Lars-Erik Fisk is a sculptor who turns things into balls. Trees, roads, barns and VW microbuses have all undergone the Fisk treatment, much to the awe & amusement of all who’ve viewed them. When not rolling up the world around him, Fisk is the Art Director for the rock band Phish. The good news? You’re riding on the coolest bus in your – or any – town. The bad news? 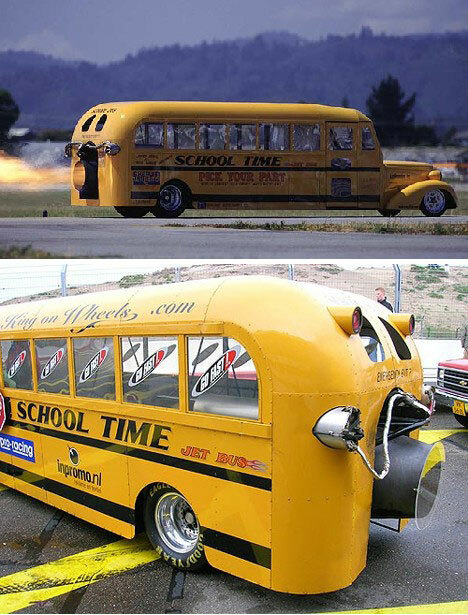 On the jet bus, you’ll never be late for school again. That’s what happens when you yank a few rows of seats from a vintage school bus and stuff a Westinghouse J-34 turbojet engine through the rear doors. Ed Rooney approves… NOT! What do you call a hybrid of a truck and a bus? Perhaps this unnatural and ill-advised vehicle could be called a Truss; it’s that ugly. Students sit in the trailer portion much like cattle on their way to the slaughterhouse – on test days I’m sure they can sympathize. 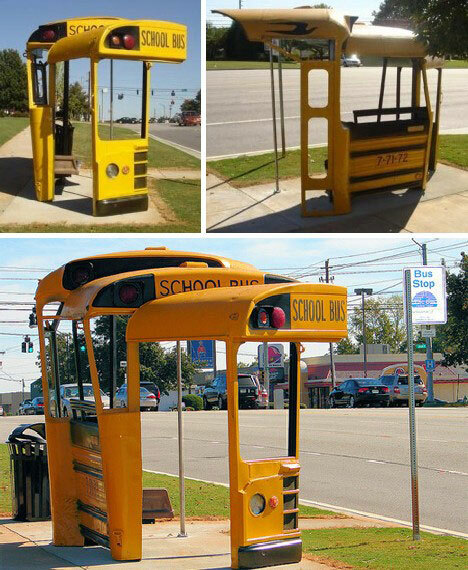 Only the bus driver gets some benefit from the configuration as he/she is isolated from the little monsters’ screaming, fighting and lunch tossing. It’s going to be very popular. This particular bus was actually involved in an accident due to its poor design. If the bus you are travelling on gets into an accident then you may be able to get compensation for your injuries. Look for a good, local personal injury attorney for legal help. 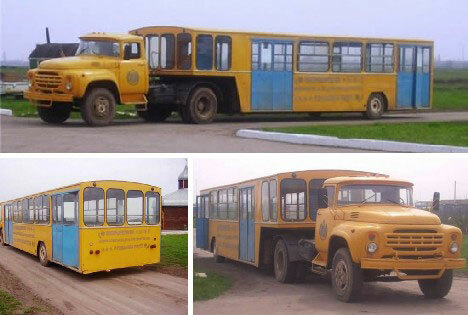 Now here’s the RIGHT way to build a truck-bus combo. The sides of the Shortcut High bus are emblazoned “Wanna be cool? 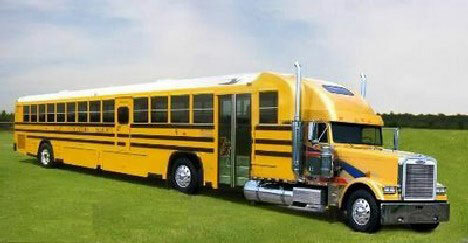 Stay in school?”, and if all school buses were like this one, then it’s mission accomplished! 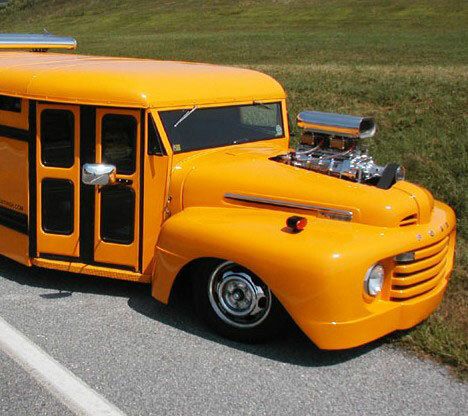 Loosely based on a fabulous ’49 Ford truck, this boss bus was the “principal” attraction at the 2002 SEMA show. Here’s another view of this awesome gangsta bus that brings stylin’ to hypermilin’. Our final entry is not a bus – it WAS a bus. Three buses actually, who together have found new life as a bus stop in Athens, GA, home of The B-52s. Strange as it may look, the oddest thing about this bus stop is the fact that the City of Athens felt the need to set up a Bus Stop sign at the bus stop made of buses.